Sometimes a thing happens that is so overwhelming that it knocks you upside the head. Yesterday's shooting at Virginia Tech was shocking and horrifying. Staggering. Sickening. And I'm embarrassed at how grateful it has made me feel for my own problems. They are all so minor. So mundane and small compared with the finality of the death of a loved one. I've had a few experiences lately that have reminded me how very very lucky I am. May you all have great and good luck. My heart goes to all of those who have lost loved ones and friends. I've been working on Peacock Feathers, but really, lace is so uninteresting to see until it is blocked, that I am tempted not even to blog about it! Alas, I have nothing more interesting, so here goes: an attempt at artsy. Doesn't quite work, does it? The horrors and problems of others do put in perspective how good our lives can be. It's good to be grateful for the riches we have. The shawl will be beautiful. I'm with you on the lace. You said a mouthful, we are so blessed and need to take the time to realize it and, I have no words for the horror, I will pray, but why...why do people do these things?! The lace will be so beautiful to wear when you're done. Creating beauty with our hands and our hearts is the only rational response to the irrationality of hatred. Yes. The difficulties of the last week have made me feel lucky--and very very sad. 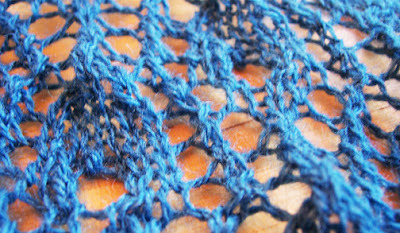 Your shawl will be gorgeous when it's done! Like you, I'm grateful for the mundane troubles in my life right now. I cannot imagine what the families are going through. We finally had to shut the news off tonight - to much information overload and no time for reflection. I agree with you, all these horrors going on in this world - in the greater scheme as well as in our smaller surroundings - sure put to perspective how minor our problems are and how good our life is. We just sometimes need a reminder, obviously. I'm looking forward to seeing your shawl when it's done! 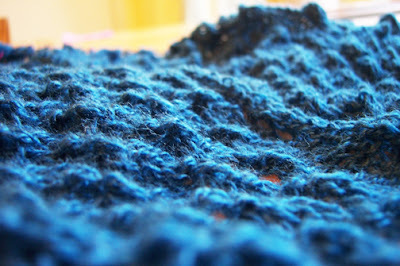 Your shawl is lovely Romi! I see you are Elizabeth Bennett!?! Fun quiz.